As if having to drive to Manchester in the rain with a knackered electric window falling open wasn't bad enough, arriving at the Apollo to find the car park full was the icing on the cake. So, it was further up the road, down a side street and leave the car in a dodgy area with a window that will open if you touch it, and then get into the venue to find special guests Periphery have already been playing for fifteen minutes. The six-piece with three guitarists have been around since 2005 and have had real trouble keeping a stable line-up, they're currently on their third drummer, fourth singer and haven't got a bass player who's a permanent member. Still, they have three accomplished guitarists, the current drummer is excellent and they have some great ideas running through multi-textured prog-metal tunes with titles like 'Buttersnips', 'Jetpacks Was Yes!' and 'Icarus Lives!' However, if they've had problems with their previous vocalists I'd suggest they still have one, as Spencer Sotelo, whilst relatively adept at the screamo style in which he spews out half the lyrics, is definitely off-key on some of the cleaner stuff. However, closing track 'Racecar' is a really good tune and will probably sound great with singer number five. A Hans Zimmer soundtrack piece and a specially created video heralds the arrival of Dream Theater, the band easing into 'Bridges In The Sky' in a relaxed manner. The first thing you notice is how huge Mike Mangini's drumkit is, with all manner of percussion toys and a rack of toms up in the air above the cymbals, alongside Jordan Rudess' futuristic keyboard set-up, in front of three hexagonal screens which project a series of flashing images interspersed with live camera footage. With a perfect sound from the beginning, a smiling James LaBrie nails the vocals on a set of half a dozen new songs from 'A Dramatic Turn Of Events' and a few back catalogue surprises. '6.00' from 'Awake' is an unexpected treat, as is 'Surrounded' (with some amazing guitar from John Petrucci), and sandwiched in between is the infectious 'Build Me Up, Break Me Down', one of the songs from their brilliant recent album. Things get a little heavier as Petrucci dominates the sound on 'The Dark Eternal Night', before the new boy dazzles with a great drum solo that's both technical and highly musical, but one of the biggest surprises is when they go all the way back to the first album for a scintillating 'A Fortune In Lies'. 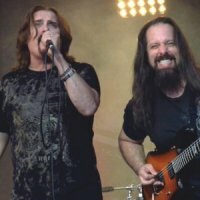 The busy 'Outcry' gives way to a first at a Dream Theater concert, the 'Images And Words' ballad 'Wait For Sleep' with just Rudess on piano and LaBrie sitting on a stool to delivering the note perfect vocal. The duo are joined by bassist John Myung for one of the new album's killer ballads, 'Far From Heaven', the rest of the band coming back on for a wonderful 'On The Backs Of Angels'. It's interesting to see that LaBrie isn't leaving the stage anymore during the lengthy instrumental sections and is engaging with the crowd a lot more, and I can't recall ever seeing the band in such a light-hearted mood, even during the more intense selections, like the frantic 'War Inside My Head/The Test That Stumped Them All' section of 'Six Degrees...'. It's back to the more melodic with an awesome version of 'The Spirit Carries On', complete with a jaw-dropping extended solo from Petrucci, whilst Rudess also gets in on the act with the set closer and possibly the best song from the latest album, 'Breaking All Illusions'. For the sole encore we get the Metallica-esque strains of 'As I Am', the band taking in the rapturous applause at the end of another superb Apollo show. Not only were Dream Theater on top form and in very good health, but the car was still where I left it!